Perry became involved in the Smollett case on Feb. 13th when she told staff members via email that Foxx “is recused from the investigation involving victim Jussie Smollett.” Later, though, Foxx admitted that she never formally recused herself from the case and said that the term “recused” was used “colloquially” and not legally. 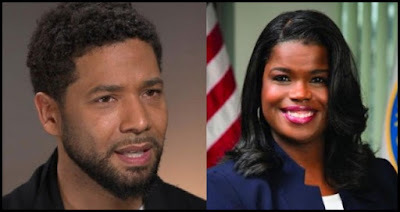 Actual recusal by Foxx would have required an outside prosecutor to handle the Smollett case, the Illinois Prosecutors Bar Association said in a scathing letter on March 28th. The handling of the non-recusal is one of many points of confusion and concern that have followed the dismissal and immediate sealing of Smollett’s case last month. I recused myself from the Smollett case out of an abundance of caution. But what most people haven’t talked about is that I did that under the advisement of our first ever chief ethics officer. We never had an ethics officer in Cook County. What I wanted to make sure when I started my term was that any decision that I made, even the appearance of impropriety would be vetted by someone other than myself. What hasn’t been talked about is that chief ethics officer is a former federal prosecutor who came straight from the U.S. Attorney’s Office who’s advised me the entire way. What I’ve said continually when I recused myself from this case was that I was not involved. Prior to joining Foxx’s team, Perry was at the U.S. Attorney’s Office in Chicago for twelve years, working most recently as Civil Rights and Hate Crimes Coordinator, according to her LinkedIn page. Perry has been handling Foxx's prosecution of law enforcement officers since Steve Block left as head of the Special Prosecutions Division in February. The City of Chicago has filed suit against Smollett, alleging the actor gave false statements in violation of city ordinance and seeking to recover more than $136,000 that the city says it spent investigating the false hate crime report. City lawyers filed the suit seeking civil penalties, triple damages, and attorney’s fees and costs. Early on Jan. 29th, 36-year-old Smollett told Chicago police that two men attacked him near his Streeterville home, tied a noose around his neck, poured bleach on him, and shouted “this is MAGA country” while using anti-black and anti-gay slurs. A grand jury later returned sixteen felony counts of disorderly conduct - false report against Smollett. The criminal case ended in a controversial emergency court hearing weeks later in which prosecutors dropped the prosecution, and the court files were immediately sealed. The lawsuit contains little new information regarding the alleged plot. Police incurred 1,836 overtime hours investigating Smollett’s claims, the suit says, resulting in payroll costs of $130,106.15. The lawsuit argues that Smollett should be civilly fined $1,000 for each false statement he made to the city, triple the overtime costs and the cost of litigation.